THEY say never work with kids or animals. But that's exactly what director Shawn Seet did in his contemporary retelling of Colin Thiele's classic Australian novella Storm Boy. 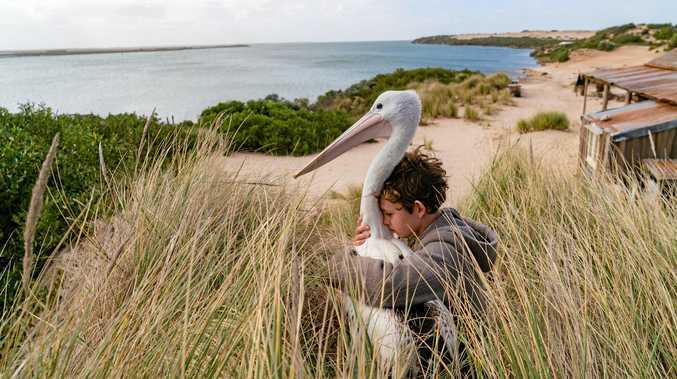 At the heart of the iconic story is the relationship between a boy living in a coastal wilderness with his reclusive father and his pet pelicans. "We talked about using animatronics or CGI to create the pelicans as we've got a lot more technology at our fingertips these days," Seet says. "But we decided to largely go with live birds. I looked in the script and thought 'Will we get that?' I knew we'd get something and that was the case. We got gold. They really had a character of their own. Some got cranky sometimes - they're very wilful creatures. It was a wonderful experience actually." The film introduces Brisbane actor Finn Little (pictured) in his first leading film role. Seet says he was blown away by the schoolboy's raw talent. "We scoured the whole country. We received 1000 or so audition tapes from every corner of the country and Finn was head and shoulders above the rest," he says. "He's so in touch with his own emotions; he's such a wise little man. "He was so raw and natural, and that's the stuff that you can't fake. If you don't have a Storm Boy then you don't have Storm Boy, that's what I kept saying." Seet and his crew also had to carefully navigate the waterways and sand dunes of the Coorong National Park in South Australia, where they filmed with the permission of and in consultation with the Ngarrindjeri. "We had to bring our own water and electricity, and travel by boat to get there," he says. "It was slow going. We wanted to keep it as pristine as possible. "We embraced the fact that we were dealing with wild animals that had a mind of their own and that the weather was changeable. 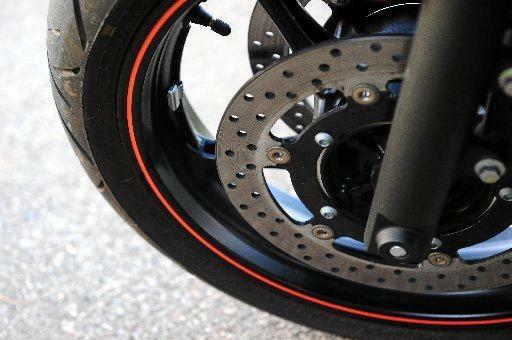 We were always prepared to drop one thing and move to another." 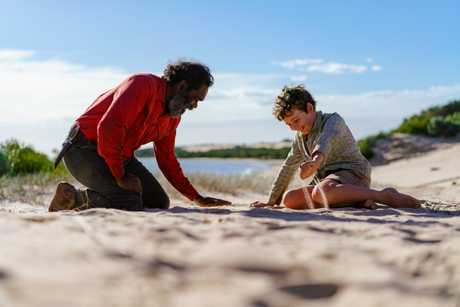 This re-imagining of the classic Aussie tale is set in the present day with now retired Michael 'Storm Boy' Kingley (Geoffrey Rush) recounting his long-forgotten childhood to his granddaughter (Morgana Davies). 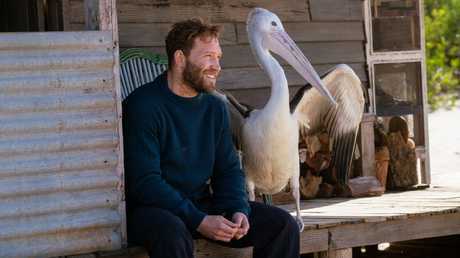 Lengthy flashbacks reveal how he rescued and raised an extraordinary orphaned pelican, Mr Percival, as well as his relationships with his father Hideaway Tom (Jai Courtney, pictured inset) and Aboriginal man Fingerbone Bill (Trevor Jamieson). The original 1976 film has a special place in the filmmaker's heart and he put as much pressure on himself as any fan would to honour the beloved story. "I saw the film when I first came to live in Australia. I was born here but I moved back to Malaysia when I was one and came back when I was 12 to live with my grandparents," he says. "I was the same age as young Storm Boy when I saw it and it really sat with me. It was partly an introduction to Australia and to the film industry. "Why the story's been so popular is it's timeless. The themes in it are so relevant now. Issues of loneliness and grief, the parent and child connection, and also our relationship to the environment are all relevant now. "I wanted to take the contemporary story and original story and let them intersect. "A modernised version is a huge responsibility, but I think everybody who worked on the film felt that. We all knew we had something very special on our hands." Storm Boy opens in cinemas on Thursday. STARS: Geoffrey Rush, Jai Courtney, Trevor Jamieson, Morgana Davies, Finn Little. REVIEWER'S LAST WORD: This beautifully shot and acted film does enough to stand apart from the 1976 original while remaining true to the spirit of such an iconic Australian story.